Revamping one of my most popular recipes and making it fall themed! 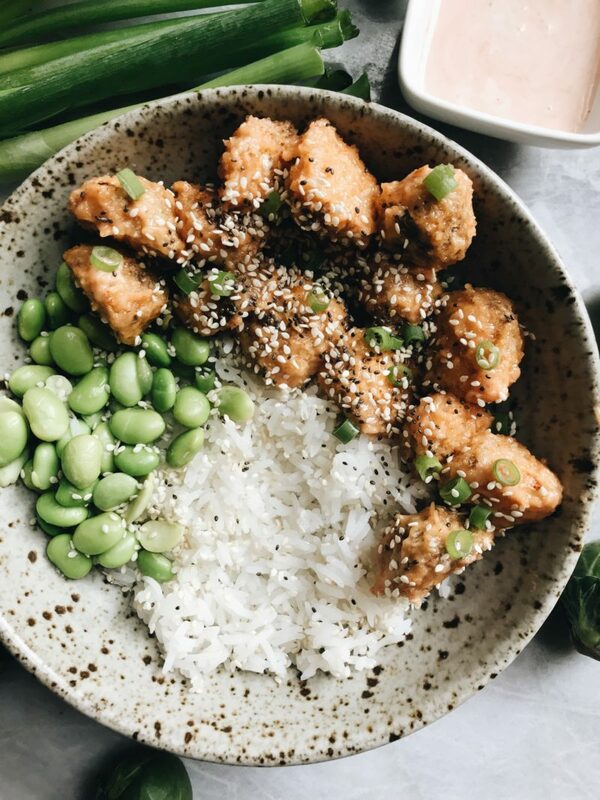 One of my most popular blog recipes is my Bang Bang Tofu. I also have transformed this recipe into Bang Bang Broccoli. This time I wanted to try this technique again but with Brussels Sprouts. I have to admit, when I thought this up, I wasn’t sure how it would turn out. However, I was surprised to see how much I loved it. Brussels Sprouts has to be one of my favorite veggies during the fall/winter time, so why not try it out for my favorite time of year. 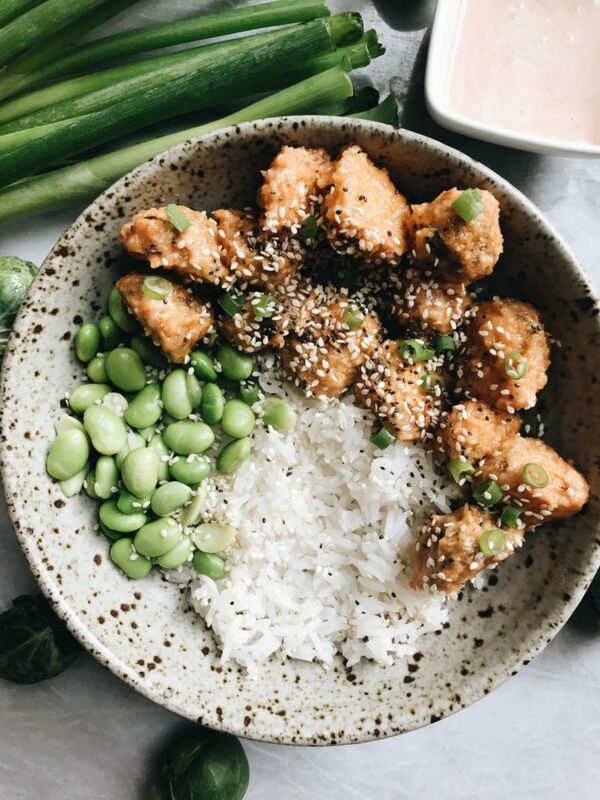 If you’re unfamiliar with my bang bang tofu/broccoli recipes, let me break it down for you. They’re not fried, but baked with a flour & water batter and dipped into panko bread crumbs. They’re baked in the oven and come out so crispy! I then concoct my spicy mayo dressing and coat the pieces in the sauce. It’s creamy, spicy, and crispy. Iconic combination if you ask me. From all of you who have told me the the bang bang tofu is non-vegan approved, it’s motivated me to try it with different vegetables. 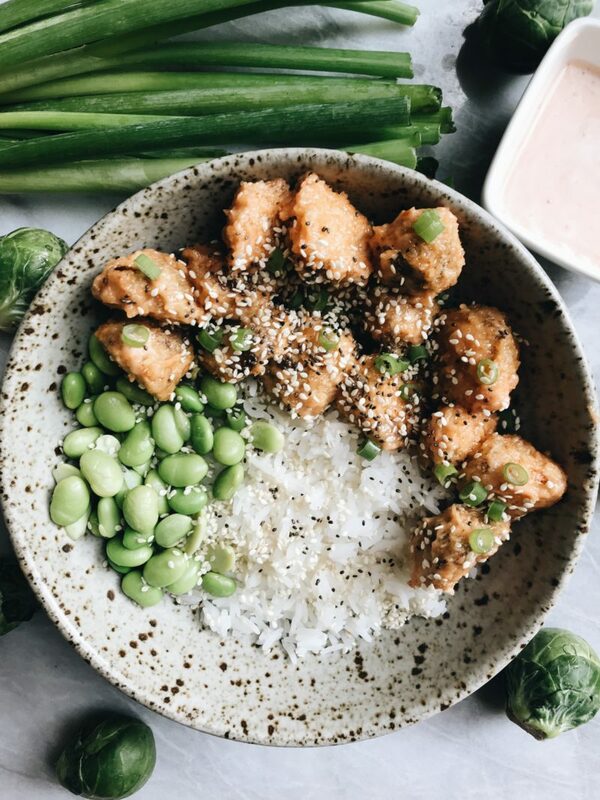 When I asked on my “Questions” while making this recipe what veggie you thought this was, I got so many different guesses. It’s motivating me to put more bang bang recipes on my blog! 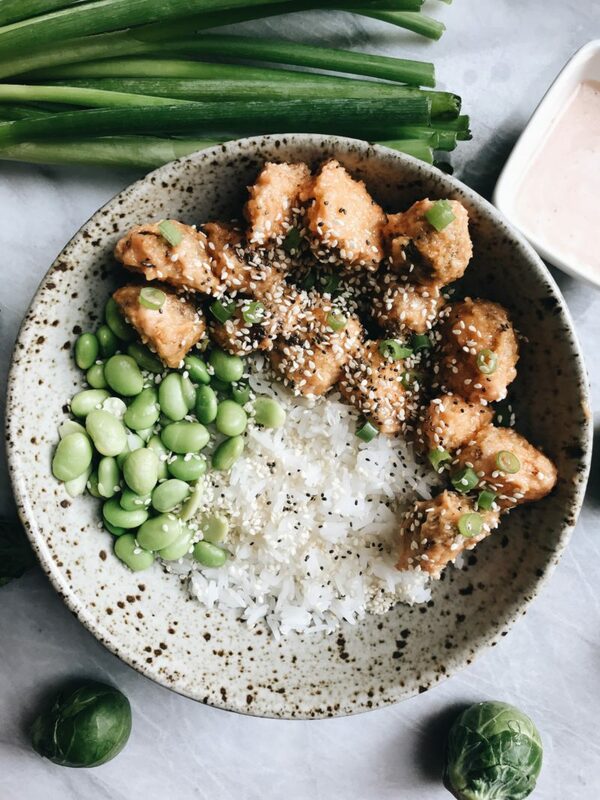 I love to serve this with some rice, edamame, and if I have on hand – avocado! I’ve also seen people use the bang bang tofu for salads, or noodle bowls. I love seeing all your creations so I am very excited about seeing your thoughts on these Bang Bang Brussels Sprouts. I hope that you enjoy this recipe! If you make any of my recipes, tag me on Instagram @plantbasedjane. Begin by washing and cutting your brussels sprouts in half lengthwise. Remove the outer leaf of the sprouts. Make your breading station. Combine your water and flour. Add water slowly until you get a runnier pancake batter. Begin by dipping your brussels in the water & flour mixture, then coating in your panko breadcrumbs. Transfer your brussels sprouts on a baking sheet lined with parchment paper. Place in oven and cook for 35-40 minutes flipping halfway. Once your sprouts are done, add them to a large bowl. Combine your vegan mayonnaise, sriracha and vinegar in a small bowl and pour over the sprouts. I often get questions about how I get my tofu/broccoli so well covered in the sauce, and the key is to mix well. Fold everything together with a spatula until everything is combined.